Just like us, our canine friends love to soak in the sun, enjoy the wild scents and have fun outdoors. So, why not give them a gift of health and happiness with a weekend backpacking trip this year? Most dogs, irrespective of their size, make excellent backpacking companions but backpacking with dogs takes more thought and preparation than going alone. 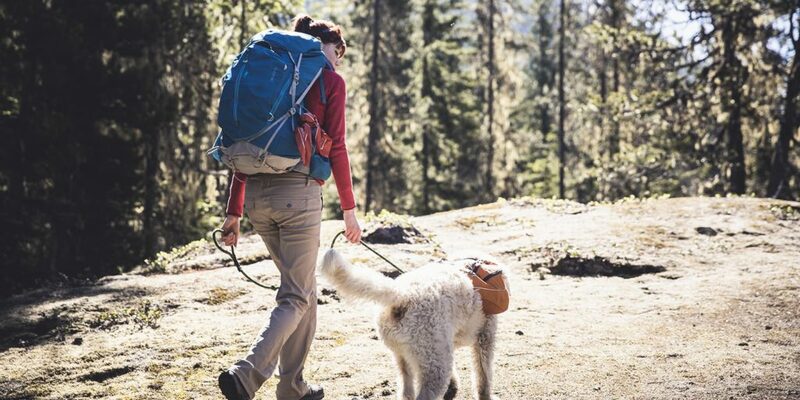 This guide to backpacking with dogs covers some important tips to ensure safe and fun backpacking trip with your canine companion. The first step to planning an outdoor trip with your dog is making sure your dog is physically fit. Get your pooch checked by a good vet to ensure your dog is fit enough to handle the trail conditions. Also, make sure his vaccinations are up-to-date. Most of the dogs do well on short hikes but if you intend to take your dog on a longer trip, you have to train him before starting anything too strenuous. In addition to being properly prepared yourself, you have to pack stuff for your furry sidekick too. A dog pack can be very useful as your dog can carry most of his stuff himself in his tiny dog pack. Buy a well fitting dog pack otherwise it will make your dog uncomfortable. Initially, make him wear his pack for some time and then progress to wearing the pack on regular walks; this way your pooch will soon get used to wearing it. Buy a water container to keep your pooch hydrated and a collapsible doggy bowl to feed him/her during the hike. Pack lots of treats to keep his energy level up during the hike. Identification tag and collar: Buy a good quality collar and identification tag for your dog and have your name, address and phone number written on it. When you are hiking with your four-legged friend, here are some important things to keep in mind to keep your dog happier, safer and the environment cleaner. Off-leash dogs can chase wildlife and get lost in the woods. They can get attacked by wild animals. An off-leash dog can chew on things like wild mushrooms and plants which can be very dangerous – even deadly. Your dog may meet other loose dogs on his way and can get involved in a dog fight. Not all people are fond of dogs. So, if you want to avoid outspoken dog haters, always keep your dog with you on a leash. If you decide to let your dog off-leash, make sure he is always in sight and within range of your commands. Always, clean up after your dog just as you would after yourself. Dogs’ excrement contains harmful bacteria that can harm and disrupt local wildlife, groundwater supplies and native habitat. So make sure to carry out your dog’s poop or bury it in a hole that it at least 6-8 inches deep. Never allow your pooch to chew on or eat any wild plants. Keep your dog calm and close when approaching cliffs. At the end of each day, check your dog’s whole body for ticks and other parasites. Also, check his paws to ensure they are in good condition. Never allow your dog to drink water along the trail. Just like us, our canine companions can catch waterborne diseases, so, always give him boiled or chemically purified water only. Last but not the least, have lots and lots of fun with your favorite backpacking companion so that when you both turn old and gray, you will have lots of amazing memories to cherish and share with the world. ← How Pruning and Lopping Can Save the Life of a Tree?